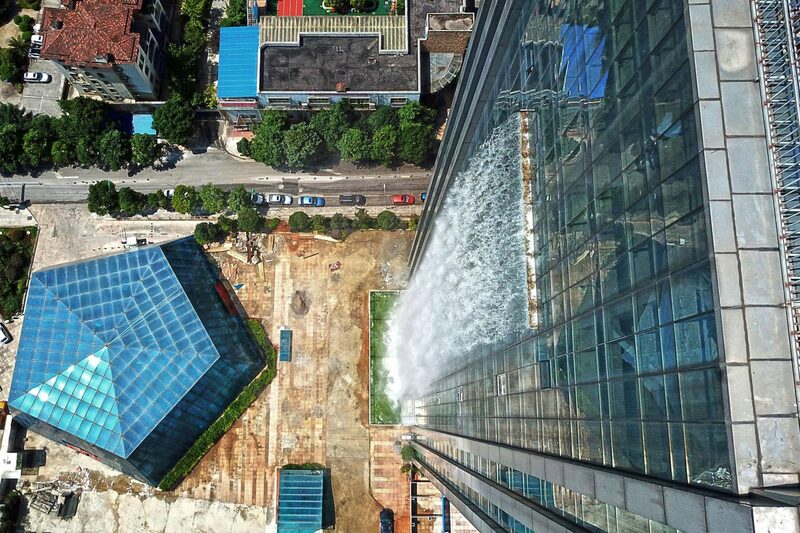 Named the Liebian International Building, the 121-metre tall tower in Guiyang, southwest China, has been built to include a dramatic a 108-metre-high water feature. This unique feature is one of the largest artificial waterfalls in the world, and the tallest to be included in a building. It is operated by four pumps that feed from underground tanks containing rainwater and runoff. The dramatic building, which is being developed by Ludi Industry Group, is not yet complete. But it is believed that the water feature has been functional for the past two years. Although full details of the tower are not available, it is part of a complex that includes another equally high tower extending upward from a podium structure. Offices and a luxury hotel will be placed in the towers, while the podium building will house a shopping centre. The building’s architect designed the tower to bring water into the city, according to Ludi Industry Group director Cheng Xiamao. “Guiyang is a city of mountains, and with many trees, just like a forest,” Xiamao is quoted in the Independent newspaper as saying. The Independent also reports that, because the running cost of the waterfall amounts to £90 per hour, it has only been operated six times. The building is part of a trend for unusually shaped structures in China that has accompanied the construction boom the country is experiencing, as developers and cities strive for attention. These strange shaped buildings include a giant doughnut-shaped skyscraper in Guangzhou, designed by Italian architect Joseph di Pasquale, and MAD’s horseshoe-shaped hotel in Huzhou. The trend led to Chinese president Xi Jinping calling for an end to “weird architecture” in the country, in 2014. Xi was particularly critical of OMA’s CCTV headquarters in Beijing. The Liebian International Building is one of several new buildings set to open soon in Asia with large-scale water features. Moshe Safdie’s Jewel Changi Airport will contain a 40-metre-tall waterfall at its centre, while Grimshaw is planning a 50-metre high water feature at the Chinese Eden Project, which would be the world’s tallest indoor waterfall. The world’s tallest artificial waterfall, the 165-metre high Cascata delle Marmore in Umbria, was created by the ancient Romans. Images courtesy of AFP/Getty Images.